Use alone or with Mobile Lectern Base (APLS260OK, APLS260WT), sold separately. For indoor or outdoor sound amplification. Powerful 50W multimedia ready amp with stereo input for computer/CD, tape and three mics, outputs for tape recorder and up to four speakers. Professional handheld mic with flexible gooseneck and shock mount mic holder. Runs on ten D batteries (sold separately) for up to 200 hours talk time, APL-S1460 AC Adapter (sold separately) or converts to a rechargeable system with APL-S1460 AC Adapter and APL-S1465 Nicad Battery Pack (both sold separately). For audiences up to 1,000 in a 10,000 sq. ft. area. 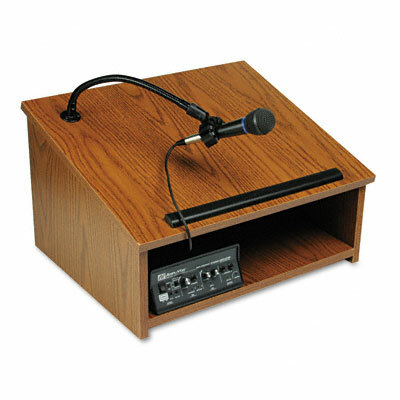 Use alone or with Mobile Lectern Base (APLS260OK, APLS260WT), sold separately For indoor or outdoor sound amplification Powerful 50W multimedia ready amp with stereo input for computer/CD, tape and three mics, outputs for tape recorder and up to four speakers Professional handheld mic with flexible gooseneck and shock mount mic holder Runs on ten D batteries (sold separately) for up to 200 hours talk time, APL-S1460 AC Adapter (sold separately) or converts to a rechargeable system with APL-S1460 AC Adapter and APL-S1465 Nicad Battery Pack (both sold separately) UL/cUL Listed Made in U.S.A. For audiences up to 1,000 in a 10,000 sq. ft. area. One Jensen design 6 x 8 frequency tapered oval speaker. Woodgrain laminate with cloth grille speaker cover.